I am still reading the books from my ridiculously ambitious list as mentioned in this post. 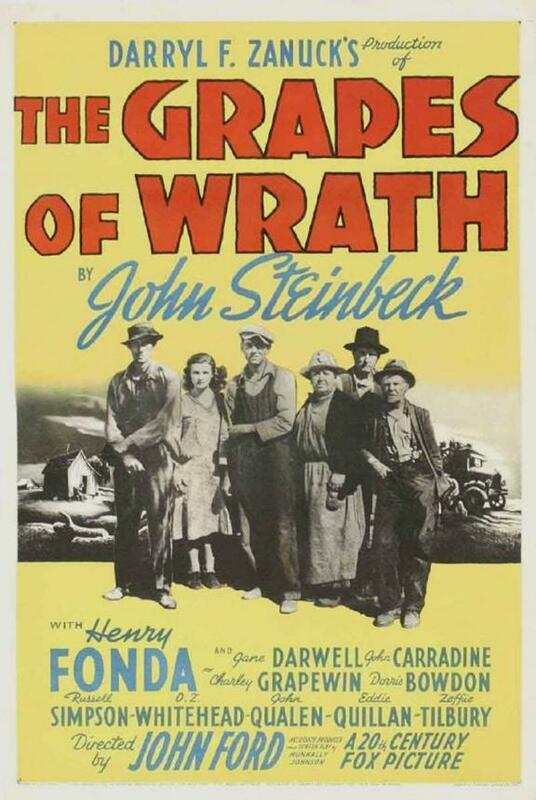 When I started reading The Grapes of Wrath by John Steinbeck (Penguin Classics version), I have to admit that I was doing it more out of a sense of obligation than an interest in the plot or characters. I have heard so much about the novel throughout the years, from sources that vary from friends who have read it to literary tests that discuss its overarching themes and character struggles. I read Steinbeck’s Of Mice and Men in middle school or early high school. While I thought it was well-written, I also felt like it wasn’t an experience I’d like to repeat. I also don’t think that I’d like to see the movie version. The movie version that I don't care to see- fun poster though! I feel the same about The Grapes of Wrath to a large extent. The last 80 pages or so were pretty depressing. I mean, I did know that it was a novel about the struggles of one family through the depression, but at a certain point I did feel a bit like I was torturing myself by continuing. The characters suffer so much, and the “epic” narrative style paints an American capitalist process that I’m not necessarily fond of. Large corporate interests overtake hard working “common” men and women during the great depression, and those men are literally driven off of “their” land (which they stole/ was stolen for them from Native peoples), then pretty much slowly starved because a few greedy landowners want to make more of a profit. The novel switches between a close and distant narration, alternating chapters between the telling of one specific family, the Joads, and the larger narrative of American “progress.” I found this description chilling and timely when we consider the wealth disparity now in place in our country. It is not only the small farmers and tradesmen/women who are struggling now, but it is also the home-owning middle class. In the novel, the Joads, along with hoards of other tenant farmers from Oklahoma and surrounding areas, are pushed off the land they tend by the banks, quite dramatically with large plows. In this telling scene, many of the family members are looking for someone to talk to about the matter, for someone to fight with about it. However, they soon find that what they are fighting is so large that they are not even able to find it, let alone fight it. The Bank is driving them, but they are unable to respond. I feel like this ties directly into the current argument being touted by the Occupy Movement, that corporations are Not people. The fact that Steinbeck was already addressing this phenomenon in 1939 so eloquently, and also the fact that the machine that is the Bank destroys human life, destroys crops, and destroys community, is pretty astounding to me. One of the quotes I think best illustrates this feeling comes early in the novel. In one of the chapters where the narrator is distant, he points out the conversation one feels is echoed by thousands. No, you’re wrong there—quite wrong there. The bank is something else than men. It happens that every man in the ~bank hates what the bank does, and yet the bank does it. The bank is ~something more than men, I tell you. It’s the monster. Men made it, but ~they can’t control it. (emphasis mine -sorry, the formatting got all wonky when I pasted the text). I feel like this discussion is very relevant for today, and because of this, I think that I devoured this novel with more zest than I was expecting. It made me appreciate how far we have not come in our understanding of the capital machines that still control and drive our country. It also made me appreciate the taste of food more. I definitely understand why it’s an American classic. It tells our story pretty poignantly, and asks some questions about the capitalist value system that are not only necessary, but that are also still being asked. Points taken away: There are definitely a few offensive-to-contemporary-readers storytelling moments in which the characters glorify the old colonial period and the killing of Native Americans, but I also don’t feel like Steinbeck necessarily agreed with those sentiments as much as he was trying to portray the Joads and other Oklahoma residents in the truest way possible. I would give this book 4.5 of 5 stars for its beautiful writing, its interesting character details, and its importance in our current historical moment. I would also highly recommend it. Read with Milk, and some sort of rustic camping food such as fried potatoes, baked beans and coffee. This entry was posted in Capitalism, Consumerism, Cultural Studies, reading, Reviews and tagged America, Book List, Book Reviews, Books, Capitalism, Culture, Grapes of Wrath, Great Depression, Occupy Movement, reviews, Steinbeck. The like is for the way the review is penned. Good gods, I think I’m having flashbacks to 1980. I may kill myself. Ha 🙂 I will admit that I was tempted to skim through some of the “distant narration” chapters along my reading journey. Thanks for sharing your opinion through this entertaining comment!